HDFn cells; Human, Rat and Cow heart homogenates; Human liver homogenate. 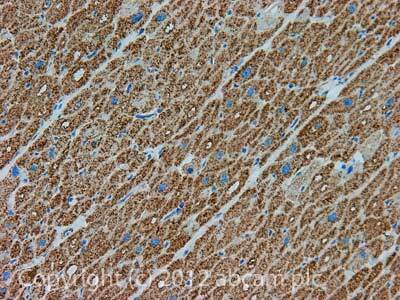 This antibody gave a positive result in IHC in the following FFPE tissue: Human normal heart muscle. Purity is near homogeneity as judged by SDS-PAGE. ab123450 was produced in vitro using hybridomas grown in serum-free medium, and then purified by biochemical fractionation. Our Abpromise guarantee covers the use of ab123450 in the following tested applications. WB Use a concentration of 1 µg/ml. Predicted molecular weight: 36 kDa. In-Cell ELISA Use a concentration of 1 µg/ml. Isomerization of 3-trans,5-cis-dienoyl-CoA to 2-trans,4-trans-dienoyl-CoA. Belongs to the enoyl-CoA hydratase/isomerase family. ab123450 at 1µg/ml staining ECH1 in 4% paraformaldehyde fixed and 0.1% Triton X-100 permeabilized HDFn cells by Immunocytochemistry followed by Alexa Fluor® 594 goat anti-mouse IgG (H+L) used at a 1/1000 dilution for 1 hour (red). DAPI was used to stain the cell nuclei (blue). ab123450 at 1µg/ml staining ECH1 in HDFn cells by Flow Cytometry (blue) or no primary antibody control (red). IHC image of ECH1 staining in Human normal heart muscle formalin fixed paraffin embedded tissue section, performed on a Leica BondTM system using the standard protocol F. The section was pre-treated using heat mediated antigen retrieval with sodium citrate buffer (pH6, epitope retrieval solution 1) for 20 mins. The section was then incubated with ab123450, 5µg/ml, for 15 mins at room temperature and detected using an HRP conjugated compact polymer system. DAB was used as the chromogen. The section was then counterstained with haematoxylin and mounted with DPX. ab123450 has not yet been referenced specifically in any publications. Publishing research using ab123450? Please let us know so that we can cite the reference in this datasheet. Please send a testing discount for testing reactivity with mouse samples by western blotting. I am very pleased to hear you would like to accept our offer and test ab123450 on western blots of mouse samples. This code will give you one free antibody before the expiration date. To redeem this offer, please submit an Abreview of WB mouse reactivity and include this code in the “Additional Comments” section so we know the Abreview is for this promotion. We publish both positive and negative Abreviews on our datasheets so please submit the results of your tests regardless of the outcome.